Your home is typically the biggest investment you make in a lifetime. Proper home maintenance is a necessity if you want to maintain its value and keep your family and belongings safe. One of the biggest pieces to your home is the roof. Too often, its is overlooked because even though you use it daily, you don’t actually see it. A roofer will check your roof for shingle condition, flashing installation, soft spots, and leaks. In addition, they should review the interior of your roofing system. Roofing contractors check your attic for the right insulation, ventilation set-up, leaks, mildew, and mold. Water damage usually begins long before you see a wet spot on your ceiling. A professional will be able to catch these leaks before they cause major damage to your home. Since you don’t check your attic or roof regularly, it’s impossible to know when something is wrong without a roof inspection. Professional roofing contractors can make recommendations for minor repairs that help you save money. If damage isn’t repaired quickly, it continues to fester and cause major damage which can often turn into a full roof replacement. Reputable roofing companies provide detailed reports with their findings and recommendations from the inspection. These reports make insurance claims easier to file and receive approval for because they explain the type of damage, what is needed to fix it, and an estimated cost. Increases the Life of Your Roof. Getting a roof inspection annually can help extend the life of the roof because you are aware of the damage and can make minor repairs as needed. When roof maintenance is pushed to the bottom of your to-do list, it can cause a premature roof replacement. On average, a full roof replacement costs $10,000 and should last 30 years. If you need a roof replacement prior to that, consider adding an inspection to your yearly home maintenance checklist. Getting a roof inspection annually gives you peace of mind that you’ve taken the necessary steps to protect your family and your well-being. Even if a roofing contractor finds damage, you will have a plan in place on how to repair it, the cost, and how to maintain it moving forward. Having a roof inspection completed annually is a decision that will save you time, money, and stress in the long run. Contact the roofing professionals at Bealing Roofing & Exteriors to schedule your free roof inspection today. 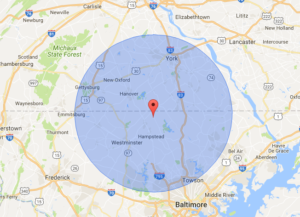 We serve homeowners in Hanover, Gettysburg, New Freedom, and Littlestown, PA, as well as northern Maryland communities like Timonium and Parkton.